Below is a basic layout of the requirements for milking a cow. It’ll either inspire you or cause you to lose your romantic notions! Hopefully this section can provide an overview of the milking requirements and routine to give a good idea of how cows are milked. 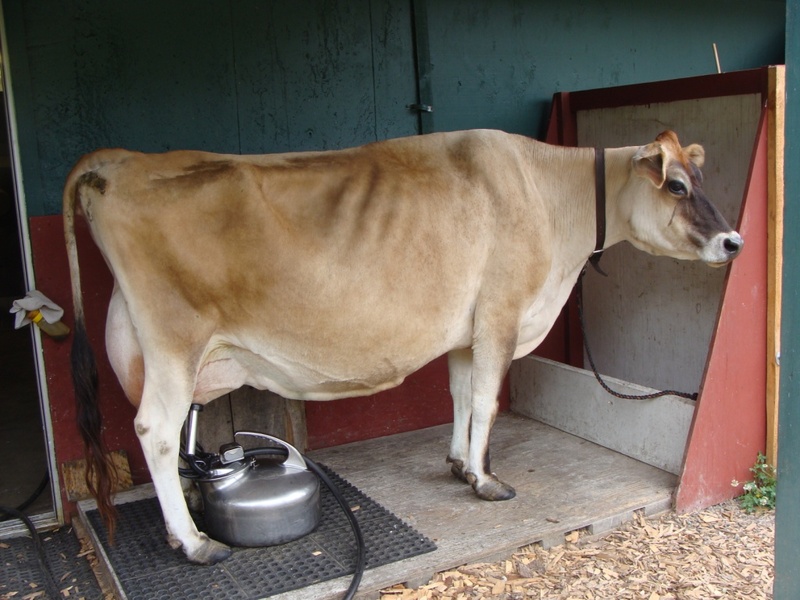 Say Hi to Rosebud, our champion milker! We like the RJB style of teat dipper (see photo) and use a pre-mixed dairy iodine solution as pre and post dip. 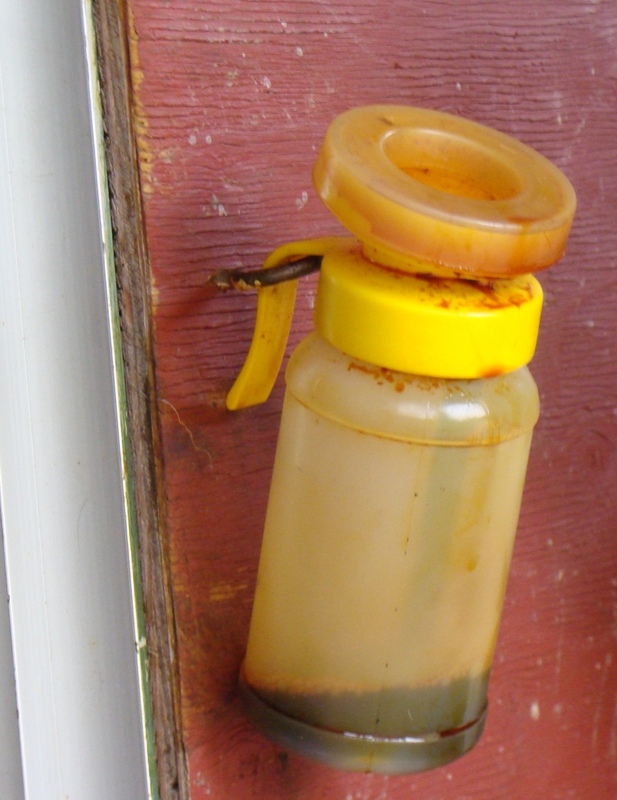 Iodine is safe and most effective in protecting both the cow and the quality of milk. 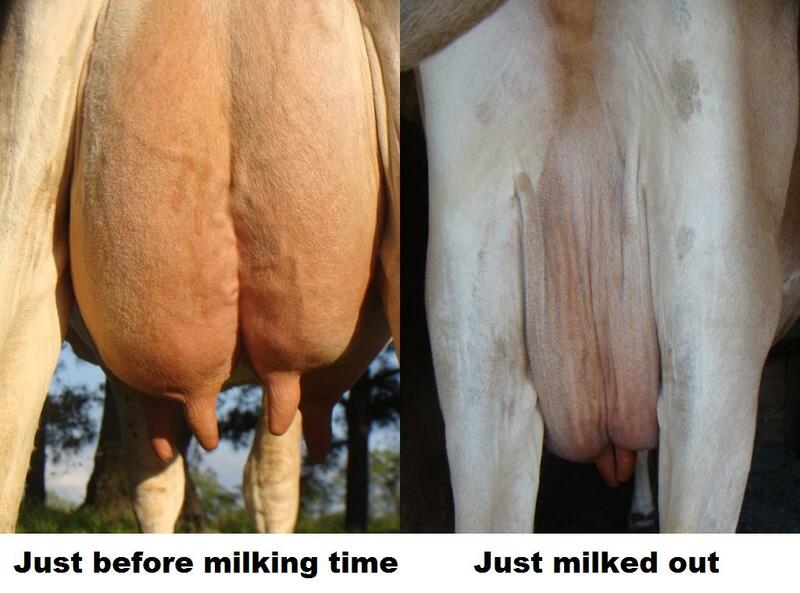 Post dip is thicker and sticks on the teat longer as the teat end can take up to 30 minutes to close after milking. If you want to use pre AND post dip, we suggest using different colored teat dippers (we have yellow and blue) to indicate that one is pre and one is post. No pinch points – avoid building anything that would require you to go between the cow and a solid structure such as a side rail or wall. If you must put in a more secure milking stanchion, build above/below/around udder area. Water is necessary for clean up (and sometimes if the cow goes to the bathroom). We’ve milked in a number of facilities (click here for more detail) but our favorite is our current location (see photos above)! have ample hot water for cleaning. The cows feet get clean as they walk through the grass or wood chips, so they’re cleaner when they get on the stand. Even in winter months, this short walk allows the cows to get some exercise, and they really enjoy the chance to leave the barn for a pre-milking treat and milkout. Hitching Post: You thought they were just for horses? The cows walk down from the barn by routine (they know what time it is!) and we clip them to the hitching post using double ties on the hitching post (so they can move a bit). Each cow has a leather neck strap that stays on her all day, that’s what we clip to. They do well walking around with just that, halters rarely needed. Platform: We weren’t sure what to build, so ended up with treated 2×8 lumber as a strong base, topped with a sheet of plywood painted white. We put another sheet with bracing on the front. We wanted to keep the platform low so the cows do not have to step up or down much. They enter from the back and exit to the side. Originally we built a bunk where the cows could be fed hay, but we have the cows on a “no treats at milking time” routine that works best for everyone. No attitude that way! 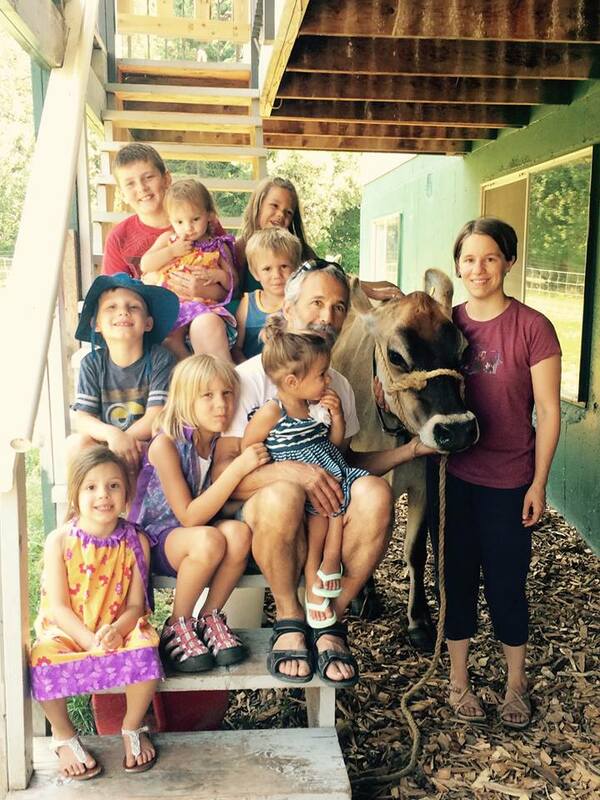 Visitors: Family and friends often come to watch or help milk the cows. 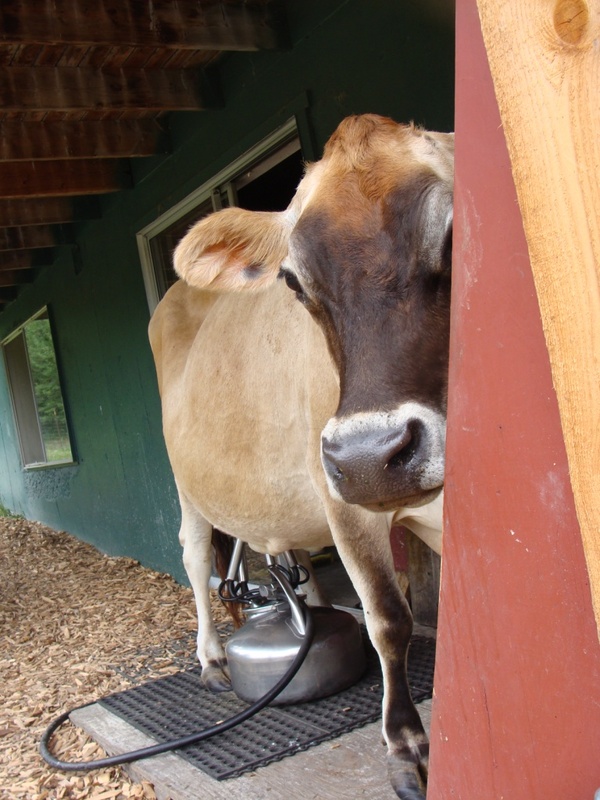 The steps to the upper porch provide the perfect resting place for any number of people to hang out at milking time! When putting on the machine, have the machine fully assembled and the air hose attached from the pulsator to the vacuum pump. 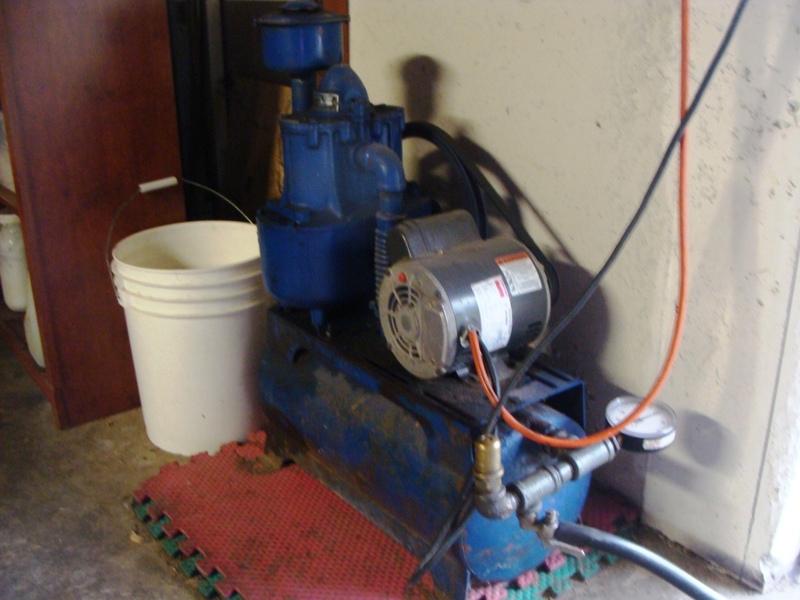 Turn the vacuum pump on before teat dipping, to allow the cow to get used to the sound of the pump and pulsation. If using a Surcingle, place across the back of the cow in front of the front hips and attach. Brush off or remove visible dirt, loose hair, etc. from udder using a brush and dry wipe teats with a clean towel if they are dirty. Pre-dip: Dip each teat with a teat dipper covering the entire teat. Wait 30 seconds. Wipe off each teat thoroughly and visually check and wipe the teat end until clean. Strip: Hand-milk each teat for a few squirts to open the teat canal and remove anything that may be in the teat canal. 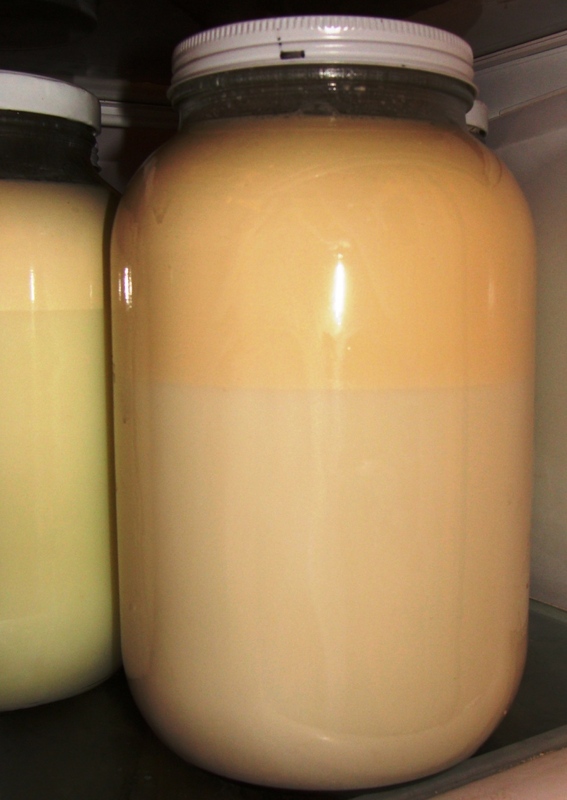 Visually check for clumps or irregular milk that may indicate mastitis. 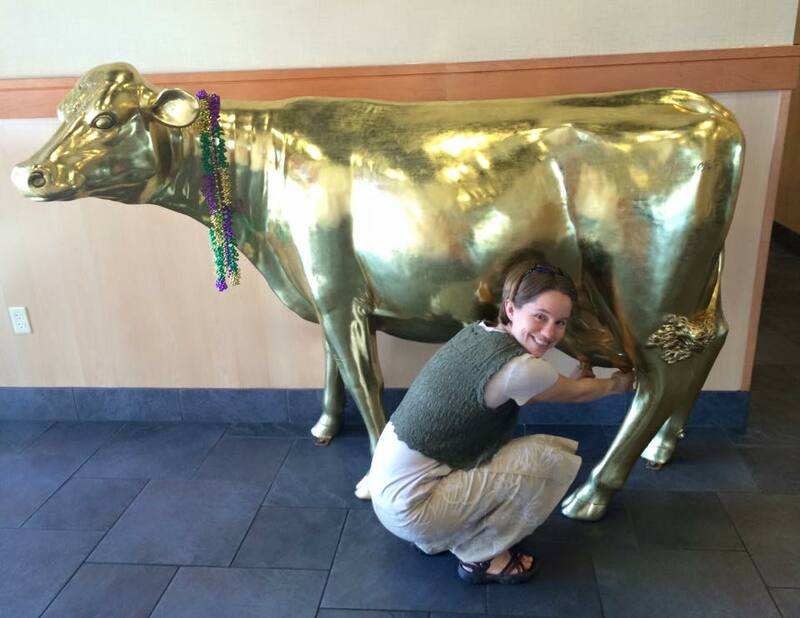 If a cow is particularly dirty, she may require a second pre-dipping and wiping. Attach machine and milk out cow. 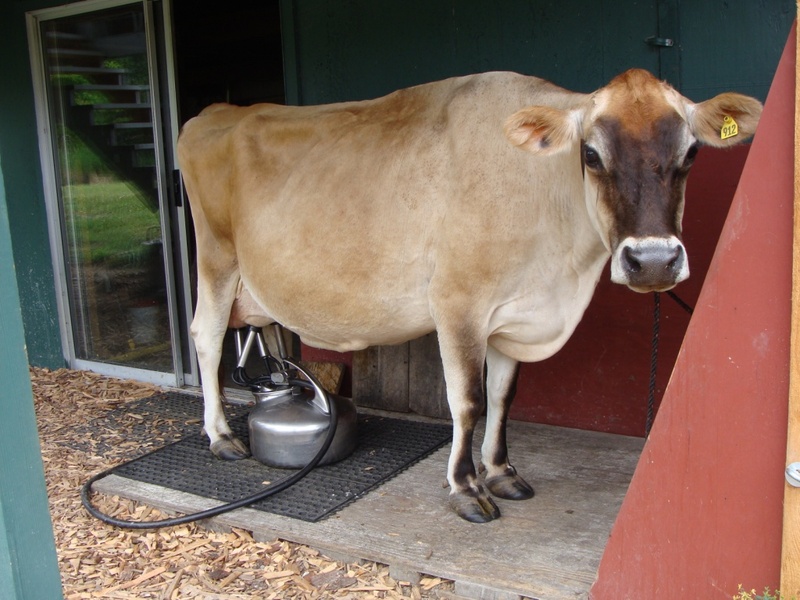 The process of cleaning the teats indicates to the cow that it’s time to let her milk down. Oxytocin is released into her system, which allows the milk to flow. After wiping the teats clean, the machine should be put on within a minute or two. One at a time, place the inflation under the teat and slide on. Avoid losing air out the inflation by crimping the bottom part of the inflation as you lift up the inflation to put it on. (It’s a technique learned over time!) 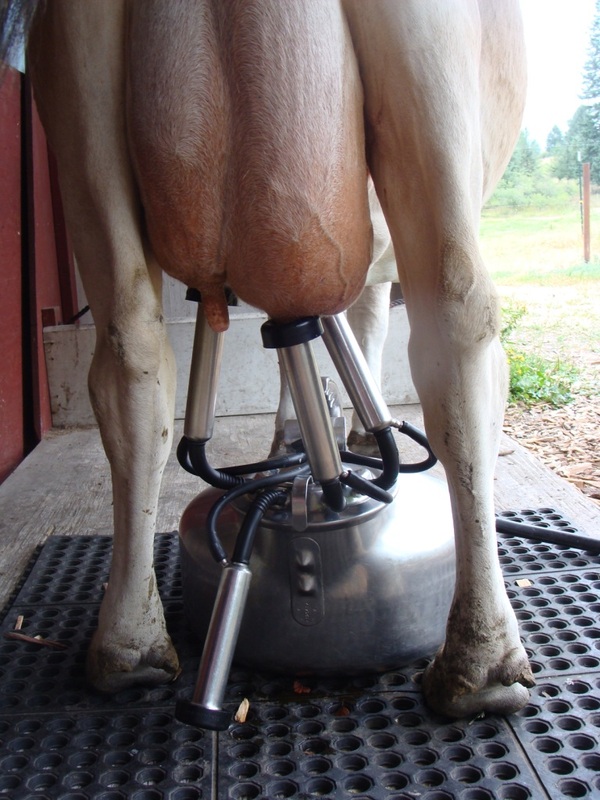 Adjust the machine if needed so that the inflations sit squarely and level underneath the udder. If the cow is nervous or does not like to let down her milk, massage from the base of the rear udder in an upwards sweeping motion. Soothing words may help as well so she knows you care. 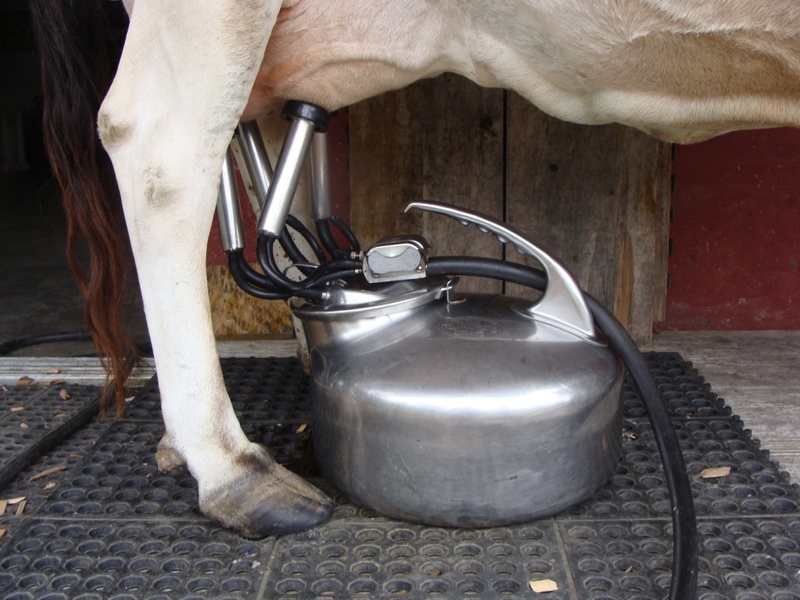 Hand milking tends to take 30 minutes or more (from what I hear from others). Machine milking on our cows takes approximately 5 minutes. Cows enjoy being able to watch what’s going on around them while they’re being milked. They are social, curious creatures. Keep that in mind when developing your milking area. 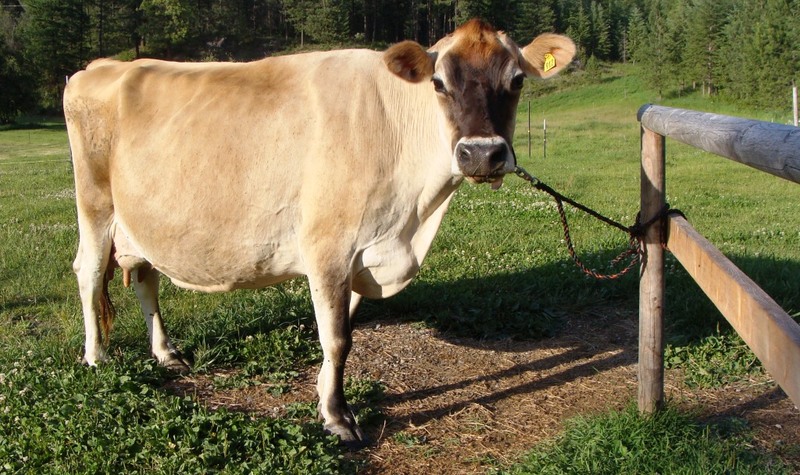 A cow is milked out when her udder is collapsed down and the flow of milk slows to an insignificant amount or stops. Note the photo below – The quarter on the left is shrunk small and the quarter on the right is full looking. The left is empty, so we took that inflation off to protect the teat from being over-milked and kept the left side inflation on to continue emptying. This is perfectly acceptable. Pretty much all cows will milk a different amount out of each quarter (for various reasons, but mostly just because things of this earth are not made perfect). Be sure to dip the teats again after milking (but don’t wipe it off this time). Feeding the cow some hay can help ensure she stays standing up for a while after milking. 30 minutes is the rule-of-thumb for time to allow the teat ends to close. That means for up to 30 minutes, the teat ends are potentially open and exposed to bacteria, which is why a post dip is so important to protect against mastitis. 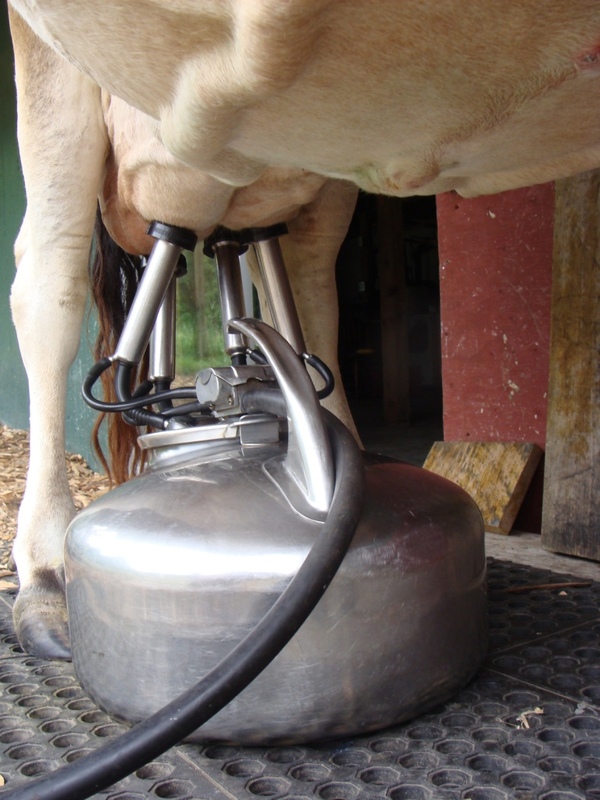 As soon as the cow is taken care of, work to get your milk cooled cleanly and efficiently. Click here to learn more about how to process milk safely. and golden cream for your coffee!